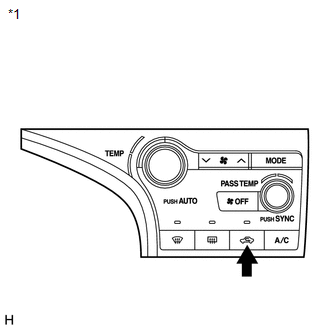 (a) Air conditioning system data and the Diagnostic Trouble Codes (DTCs) can be read through the Data Link Connector 3 (DLC3) of the vehicle. When the system seems to be malfunctioning, use the Techstream to check for malfunctions and perform troubleshooting. 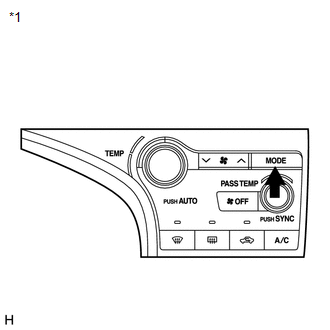 (a) By operating each of the air conditioning control switches as shown in the diagram below, it is possible to enter diagnostic check mode. (b) Turn the ignition switch to ACC and wait at least 5 seconds. 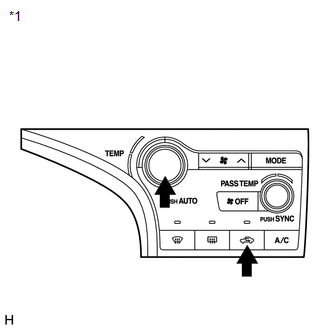 (c) Turn the ignition switch to ON while pressing the A/C control "AUTO" switch and "Recirculation/Fresh" switch simultaneously. Hold both switches until the indicator check screen appears. 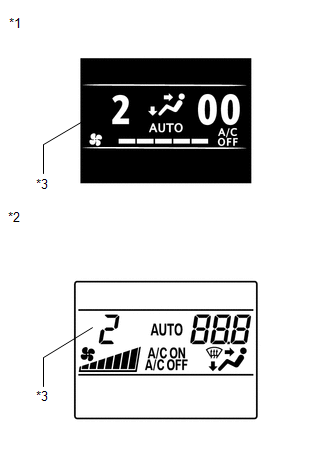 (d) The indicator check is automatically performed when panel diagnosis is activated. 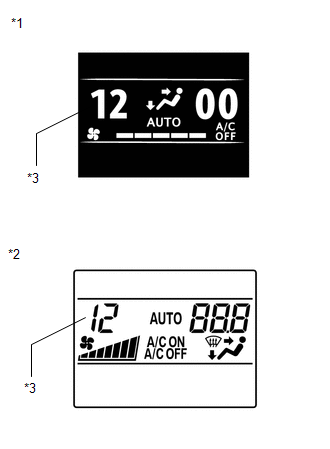 Check that the indicators light up and go off 4 times at 1 second intervals continuously. 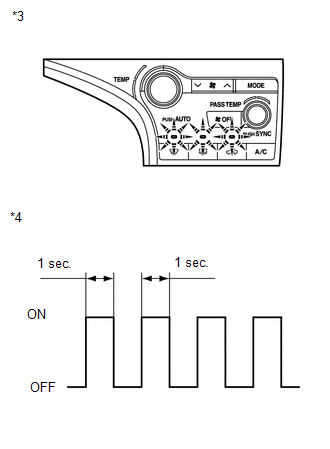 The sensor check automatically starts when the indicator check is completed. Press the "OFF" switch to cancel the check mode. (a) Start the engine and warm it up. (b) Perform the indicator check. After the indicator check is completed, the system enters DTC check mode automatically. 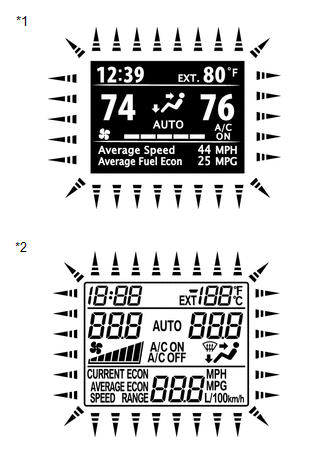 (c) Read the DTC displayed on the accessory meter display. In sensor check mode, which is automatically entered after indicator check mode, troubleshooting may be partially performed. Be sure to perform the actuator check, and then the sensor check again. 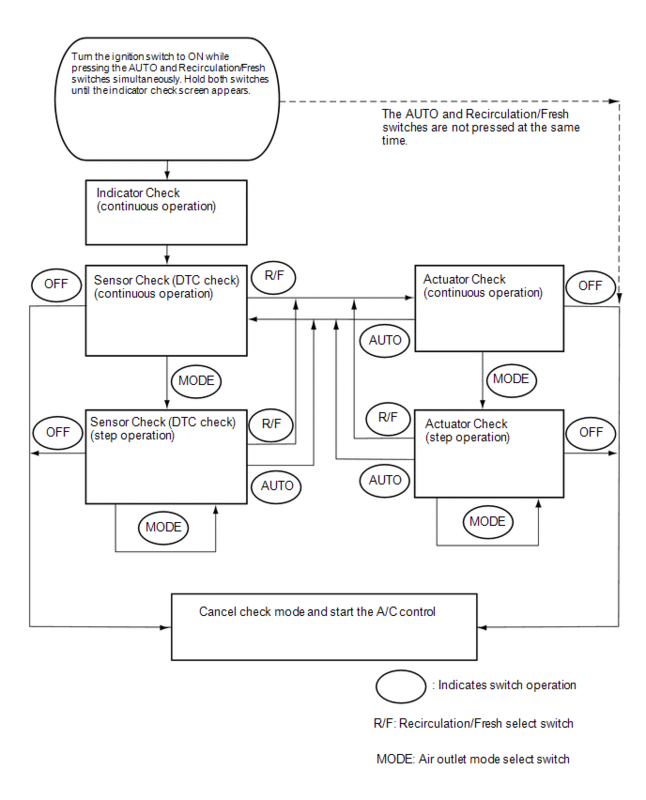 Refer to Diagnostic Trouble Code Chart for details of the codes (See page ). When there are no problems, DTC 00 is output. As an example, the illustration shows that display DTC 12 is output. (d) If the steps are difficult to read because they change automatically, press the "MODE" switch to display the steps one at a time so that they can be read easily. The items are displayed step by step each time the "MODE" switch is pressed. Press the "OFF" switch to finish panel diagnosis. Press the "Recirculation/Fresh" switch to enter actuator check mode. (1) During the sensor check, press the "Defroster" switch and "MODE" switch simultaneously. (c) Press the "Recirculation/Fresh" switch to perform the actuator check. Be sure to perform the actuator check after starting the engine. 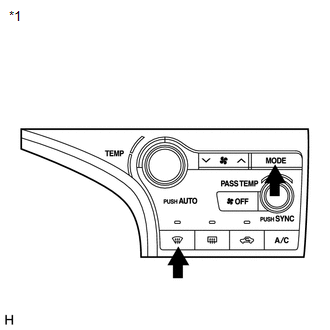 (d) As the actuator check is repeated from steps 1 to 10 at 1 second intervals, check the temperature and air flow visually and by hand. The display blinks at 1 second intervals in the step operation. Press the "AUTO" switch to enter sensor check mode. (e) If the steps are difficult to read because they change automatically, press the "MODE" switch to display the steps one at a time so that they can be read easily. The items are displayed step by step each time the "MODE" switch is pressed. Press the "Recirculation/Fresh" switch to enter sensor check mode.